The light part of the fan/light combo is served by the hot on the 3-way switch. The fan is served by the hot from the "outlet" run switched by the fan switch. The neutral for both is from the "lighting" run. Notice the neutral from the "3-way run" connected to the "light" and on to the light/fan. Boiled down: is it allowed to use a single neutral on the 12/3 for two "hots" that are served from separate runs of the same circuit? Possibly similar to this answer. UPDATE: The revised drawing does indicate that the neutral wire is in the same cable as the hot wire(s). Consequently, the neutral is on the same circuit and in the same cable, as allowed under the code. While there are two hot wires, they are actually the same circuit and merely one hot, using two wires and switched separately for fan and light, a very common pattern. Another way of putting it is that the currents must be equal (cancel each other out) in each cable. As you have drawn the picture above, I'm a little confused by what's going on with the 3-way switches, but you will have unequal currents in the rightside 12/2 run. You could still do it by adding some more 12/3 and islanding the 3-ways, i.e. Have both 3-ways be dead-end spurs off the "junction", then bringing neutral and switched-hot for the light up on /3 via the fan switch. If that makes sense. Is it okay to run a switched and unswitched hot on the same neutral? Can I use a neutral from another circuit to install a 3-way switch? How can I separate a light switch to power two different devices? 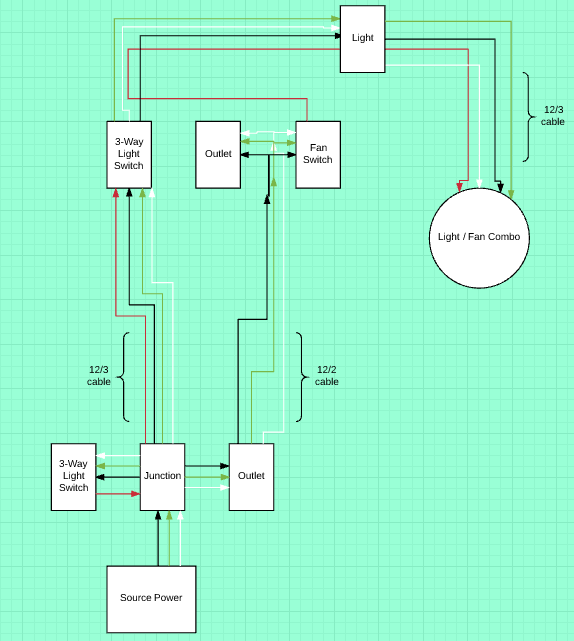 Is my plan for a new bathroom lighting and fan circuit code-compliant?